The drive towards Gabès was a long one, with nothing on the way, and after the boat from Kerkennah docked and we fought our way out of Sfax, we knew we were a bit tight on time. So when we arrived in Gabès, about ten minutes after darkness had fallen, we were glad that we had a definite destination to head for – the Fella Park campsite was alleged to be only 1.5km out of the town centre along the well-signed road to Matmata. So when we headed along the Matmata-signed road out of town, and didn’t find anything after a good chunk more than that, we started to be a bit concerned. No, it’s OK – there it is. Oh, wait. It’s locked up tight, all doors chained and padlocked. And nobody’s answering the phone. Gabès is a pleasant city, and the impression that immediately grabs you is one of cleanliness – the rubbish which is strewn across so many streets (not just in Tunisia – virtually all points Naples and south) was almost entirely absent. Given that it was a public holiday, it also seemed a very lively city – plenty of bustle and activity. Very little of it touristy, though, despite the myriad of tat-stalls lining the road into town. The souk itself also had more than its fair share of tat stalls – and I mean _utter_ tat, gawd knows who buys it, since this isn’t a major tourist destination at all, with an almost total lack of “sights” – but was also clearly the main retail centre of the city. Again, plenty of life – and not just on the food stalls, but even down the back streets where the noisier and smellier trades were carrying on, away from the Great Mosque. The Rue des Forgerons is little changed, full of knife-makers and -sharpeners, blacksmiths with open hearths roaring away and anvils being hammered against, and small holes-in-the-wall with umpteen decrepit Mobylettes and other old French mopeds in various stages of dismemberment spilling out. Our return to the campsite soon gained a fantastic soundtrack. From the patch of wasteground from over the wall, drumming started to swell, soon joined by voices chanting. This continued, growing in volume and enthusiasm, for well over an hour – unfortunately, we couldn’t see what was going on – the wall was too high, and our return had coincided with a visit from the management to the site – they’d since left, locking the gates again! On the way out of town, we stopped in at the village of Chenini, on the edge of the palm-filled oasis that marks the city’s northern boundary. The village itself was low-key, but there were apparently some wonderful gorges a short walk along a footpath. We found them, again a bit low-key, surrounding the remains of a deserted holiday camp. The road from Gabès to Djerba crosses the WW2-era French defensive line at Mareth. There’s a military museum there, run by the defence ministry with freshly polished and painted field guns outside the door – we didn’t stop in, though, and continued on to the ferry which provides the best approach from the north to the island. As we joined the line, wondering where to find some lunch, a guy was just walking down the vehicles selling fresh Metabka – the same “Berber Pizza” we’d enjoyed on Kerkennah. Perfect timing! 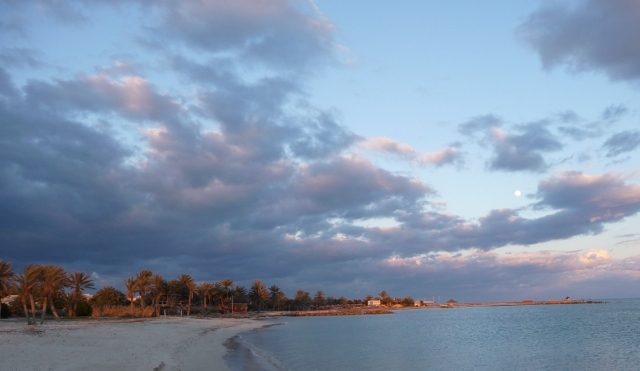 Along with the resorts we went through a bit further north, Djerba is one of Tunisia’s main package-tourist destinations, and most of the east coast of the island is “Zone Touristique” – Club Med, quad bike hire, golf courses, thalasso spa hotels and tat shops a-go-go. The capital, Houmet Souk, is a small town on the edge of the zone touristique – the souk suffers a bit from that, but on the whole, the place is as unspoilt as the rest of the island. As well as the souk in the middle of town, there’s a bi-weekly “Libyan” street market – so close to the border, barely a hundred km away, traders from Libya would originally have brought goods otherwise unobtainable in Tunisia to sell. Nowadays, it’s very similar to any other street market – including fresh fruit and veg piled high straight onto the ground or overflowing from the back of pickups. Nearby, a large area seemed to be devoted to stalls selling second-hand clothes, brightly coloured material being picked through and strewn around, from table to ground. 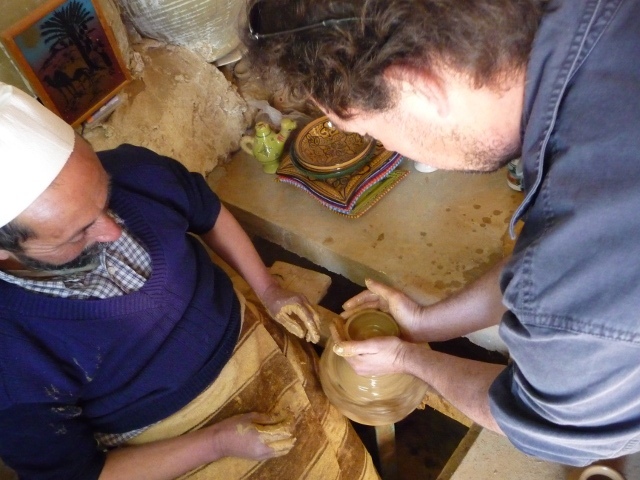 At one end of the island, the small town of Guellala is a centre for pottery, with many pottery workshops and shops to show for it. We stopped in at one, half-buried to provide a more even temperature the year round and prevent the clay drying out prematurely. 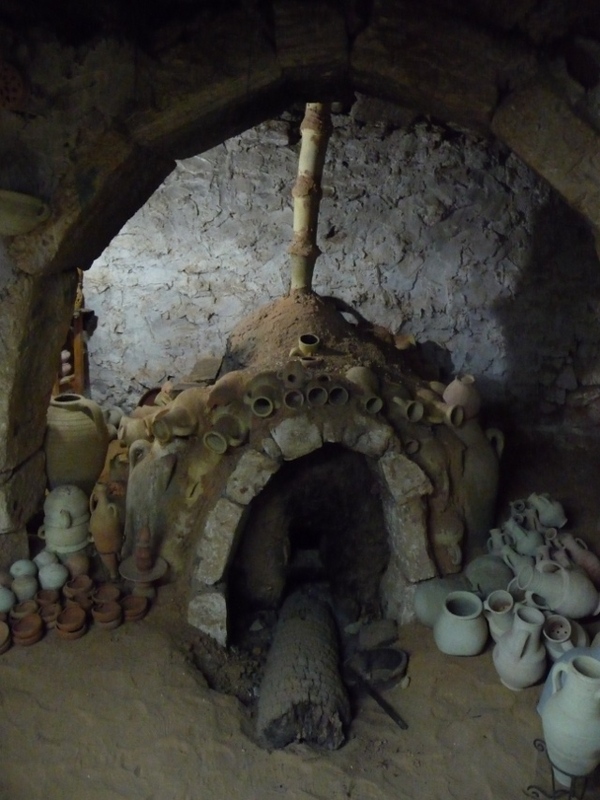 At one end, the palm-wood fired kiln sat, looking more like a hobbit’s cottage than an oven capable of a thousand degrees centigrade. The proprietor kindly demonstrated his skills, making it all look so easy. So easy, in fact, that when he offered a go I couldn’t possibly refuse. Let’s just gloss over my results, shall we, and say that it really wasn’t as easy as it seemed? 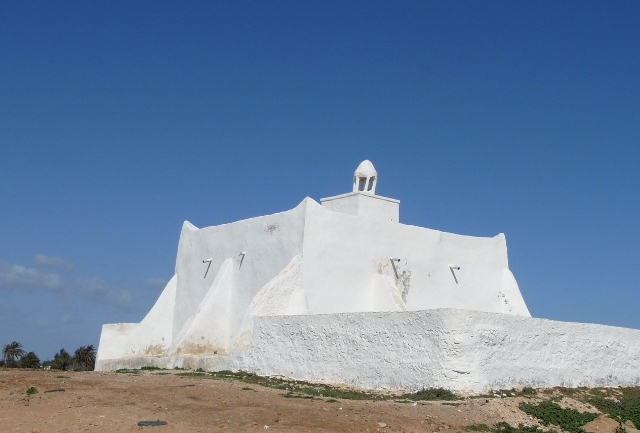 Guellala also has one of the island’s ancient mosques – this one’s relatively new, “only” being fifteenth century – others go back to the ninth century. 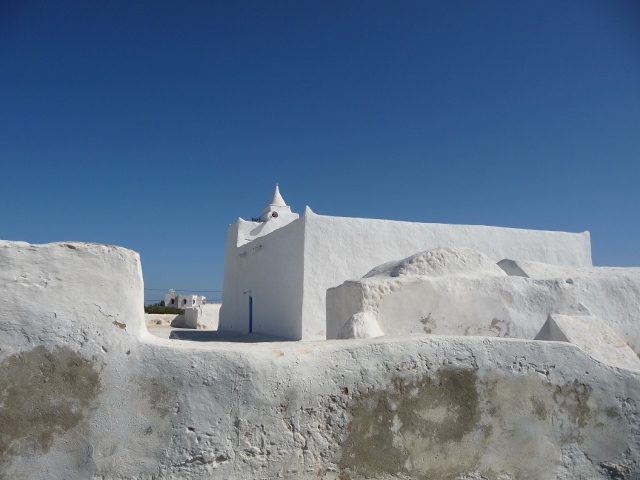 Many of the mosques, along with some of the older houses, are lightly fortified, with high windowless walls surrounding their compounds – and all sat, whitewashed, in the sun against a backdrop of bright blue sky. Wonderful. For most of our time on the island, we camped at another Centre des Stages et Vacances, at the other end of the zone, and got a fantastic sea view from our plot right on the edge of the sand. However, for our last night, we moved from the campsite into Houmet Souk, and treated ourselves to a night in a hotel in an old “fondouk” – originally, offering shelter and food to traders, pilgrims and other travellers, around a central courtyard where their camels and goods would have rested the night. 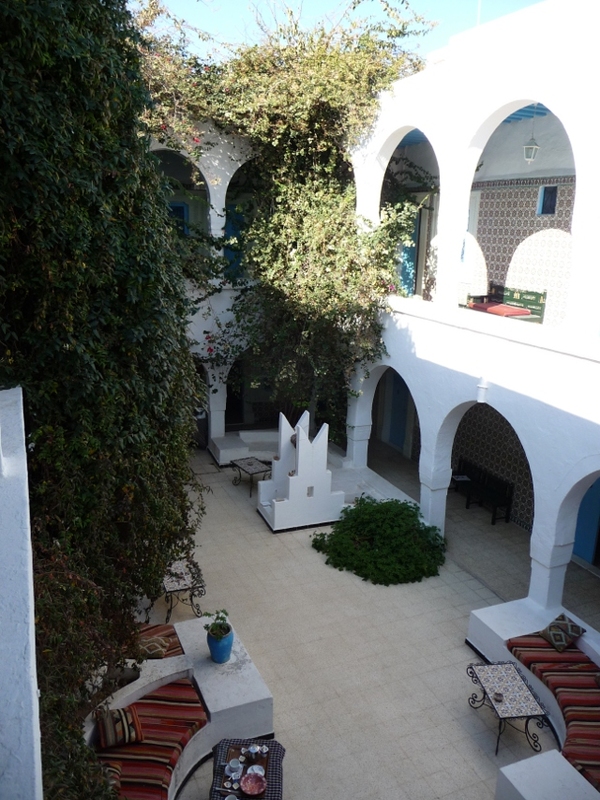 Brightly coloured patterned tiles were everywhere, even around the bed structure in our room, whilst large climbing plants in the courtyard were thick with loudly chattering roosting birds. Breakfast, of course, was served in the courtyard – a bit chilly before the sun climbed high enough, but so pleasant as to be irresistible. Canadians Jacques and Simone, who we’d met in Palermo, turned out still to be on Djerba, too. They were staying at a different campsite, near to a sandy spit of land known as “Flamingo Point”, in the middle of the zone. A very newly opened site, the boundary wall was so freshly built that there was no signage at all – when we went to say hello, we only realised the site was there by spotting the roofs of a couple of motorhomes over the top of the wall. When it’s finished, it should be a nice site – but for the moment, we preferred our sea view to the freshly built loo! Mind you, they certainly had a lot more flamingos than we did – the shallow water just the other side of the main road from their site was thick with the big pink waders. 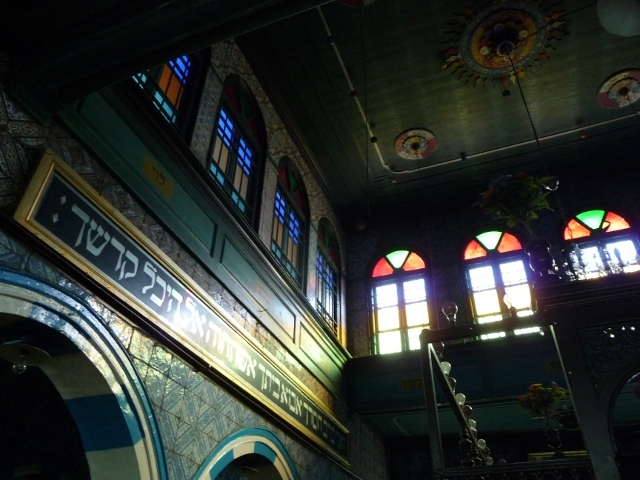 Djerba has also long been renowned as a base for the Jewish community. Here long before the Arabs arrived, bringing Islam in the eighth century, there’s still a couple of Jewish villages, one of which is home to a large synagogue which acts as a point of pilgrimage to many. After being on the receiving end of a fundamentalist bomb attack in 2002, security is tight – an airport-style X-ray machine has to be negotiated before you can enter, but it’s well worth it – once you’ve donned a borrowed skull-cap, the main hall is bright and colourful, with ancient Hebrew texts on the walls, and chanted verse filling the air around you. As well as the ferry, there’s a causeway – originally built by the Phoenicians – linking Djerba to the mainland, and that’s the route by which we left the island, heading south and inland, towards the desert.